I was 10 years old in 1954, when we bought our first television. We didn’t even buy the television to watch television. If I remember correctly my sister had a lazy eye, and prescribed a television (talk about an expensive prescription) so she would use her lazy eye more. We fixed a screen on one side that fit over half the screen, that made her use her lazy eye. If it wasn’t for her eye problem we probably wouldn’t have bought a television so soon. The first thing I remember watching on the television was the movie Buck Privates (1941) with Bud Abbott and Lou Costello. Howdy Doody would come on at about 3:30 in the afternoon, then was followed by Pinky Lee, then usually a western movie with Bob Maynard, Kit Carson, Gene Autry and many others would come on till it was time for the Camel Caravan news program with John Cameron “It takes a licking and keeps on ticking” Swayze doing a 15 minute news program. He was later well-known for being the spokesman for Timex watches, as he demonstrated how much abuse the watches could take and keep on ticking. We only had one channel at first, so we had no problem working the controls. It became more complicated, when cable television companies began to go into business. We then had the old wired remote controls, which later went the way of the do-do bird and gave way to remote controls with batteries. Now we could not only change the channels, but could also turn the volume up and down, adjust the picture, record programs to watch later and best of all could zap through the commercials. Sponsors of the television programs were not too hep on the idea, since you record a show, then watch it about 20 minutes later and zap through the commercials and cut an hour-long show into about 40 minutes minus the commercials. After the show we would wonder who was sponsoring the show. We got along fine without cell phones, since there was no such thing in 1950. I only had a cell phone when I needed one for working as a caregiver, since I had to call the office all night, so they knew I wasn’t dozing off at work. I haven’t had a cell phone since 2011, since I never did learn to text on the contraptions. We didn’t Google it in 1950. We would just go to the library and would usually find the information there. It would be 48 years later, before we could Google it and find information in seconds, that used to involve riding to library and digging through index cards, or going through the reference books section to find the same information, that we can find in seconds today. I don’t remember having a microwave oven, while growing up so got along well without one. I did find out later, that after buying one years later, that it was easy to ruin popcorn, by cooking it too long. Now I never cook it as long as recommended, to prevent having to throw out charcoal popcorn. My favorite use for microwave ovens is to melt ice cream in it. I am not a fan of ice cream right out of the freezer, so would put it in microwave and leave it on for about 2 hours….just kidding….about 35 seconds later the ice cream would be good and creamy but still cold. It was about 1966 or 1967 when we got our first air conditioner. I was about 21 at the time and had just came back from Vietnam, and was thinking it would have been nice to have an air conditioner over there. 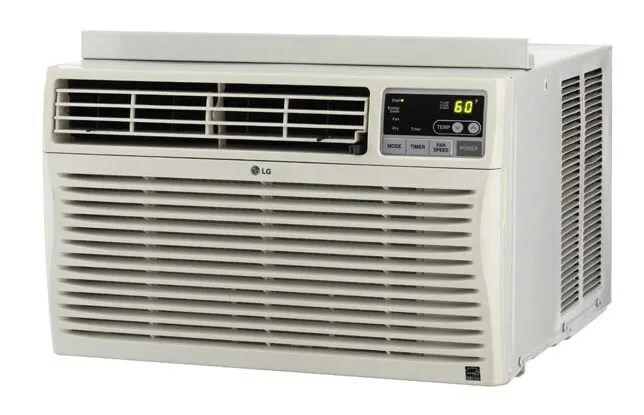 I didn’t know how to act with an air conditioner, since I had lived 21 years without one, so it took awhile to get used to putting on a jacket when the air conditioner was running. I didn’t have to worry about putting on a jacket from 1992 to 1998, since I was in bankruptcy and had to choose between eating and staying cool and eating won out. I bought a 10 inch box fan and had it blowing on my face, and I was able to sleep at night with no problem during those six years. I couldn’t wait to get to work at Town Talk, since air conditioning usually worked there. I remember when we were growing up that we bought ice in blocks and put the blocks in the refrigerator. About 60 years later we bought our first icemaker, since my wife liked to have crushed ice. It was nice having crushed ice, till the icemaker went on the blink. Best of all it saved paying $2 or more for a bag of crushed ice. 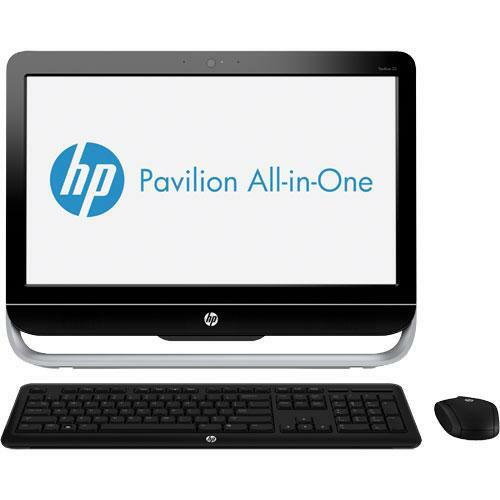 The only personal computer we owned back in 1950 was our brain that computed what we learned in school, and solved math problems before Common Core made it all complicated. My mother bought us our first computer, a Commodore 64 which was very rudimentary compared to the computers of today. It was mostly a machine to play games on, and we sometimes would type the code for games out of magazines published for Commodore 64 users. Later on we bought more advanced computers, but they were still too complicated for me. It took me a year to figure out how to send emails. I have never been a computer whiz. I know how to do the basics like copy and paste, but don’t ask me how to hook up a router or modem, or the computer may cease to function. Before we bought our television in 1954 the only entertainment we had been listening to was old-time radio shows on our table radio, and playing records on our phonograph player. Then cassettes became popular, but were a real headache if the tape got tangled up inside the tape player. 8 track players were also around about this time, but I completely missed the boat on 8 track players, since I never owned a 8 track player or a 8 track tape. The compact disc became the most popular way to listen to music, since the CD players let you pick a certain track if you wanted to play it, unlike cassette players where you had to more or less play the whole tape to hear a song from the starting point. It was 2004 when I bought my first MP3 player and I was surprised to learn that you could carry thousands of songs, in one device and the Creative Nomad Zen Xtra Jukebox (pictured above) was my first MP3 player. It was 40 GB and I had 3,000 songs on it the last time I checked. You could go directly to any of the 3,000 songs in a matter of seconds. One of my favorite uses for the MP3 player was to listen to old-time radio shows from the 20’s, 30’s, 40’s, 50’s and 60’s. I found out I could buy 800 Jack Benny shows for $12 on a MP3 CD. Sam’s at about that time was selling about 10 shows for $20, so I bought the MP3 CD’s exclusively from old-time radio retailers and ebay sellers and it was possible to build up my collection fast. I currently own 17,000 episodes of many old-time radio shows of all genres. Best thing all 17,000 episodes fit inside one binder manufactured for CD’s. All I had to do was place the MP3 CD’s into the computer and copy the files into the computer, then transfer them from computer to the MP3 player, and it works the same way with regular music CD’s. 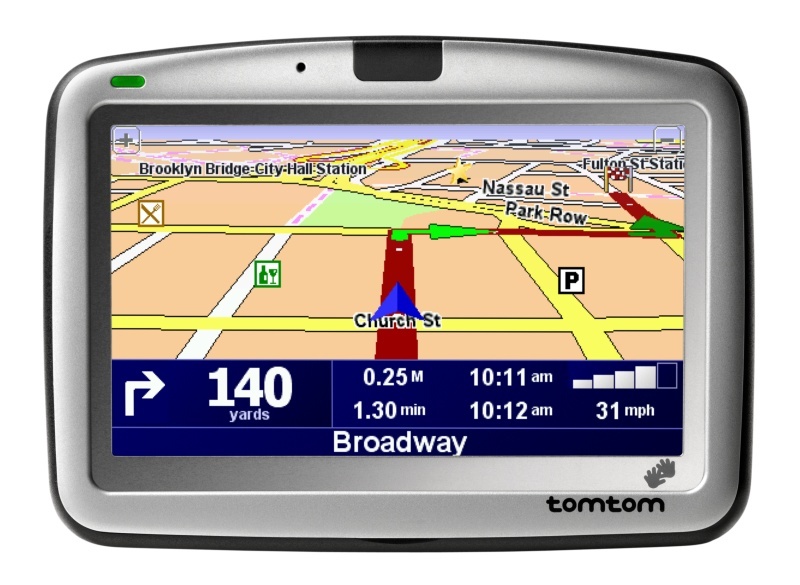 Whoever invented the GPS probably had me in mind, since I hated folding and unfolding paper maps, to find out if I was going the right direction, to arrive at my destination. I don’t know how many times I had taken wrong roads, before the GPS was invented. It still is scary when the GPS tells you that you have arrived at your destination, when you are in the middle of nowhere with no houses in sight. It is amazing to me that this lady telling me directions is flying around up in space, with nothing better to do, than to keep an eye on my vehicle, and if I miss a turn she is nice enough to say recalculating and letting me know we will still arrive even if it is a 20 mile detour to get to the destination. One of the handiest inventions is the automated teller machine, that gives people money at all hours of the day and night. It used to be if they locked up the bank on Saturday afternoon, then the customer would have to wait till Monday morning to make a transaction. Now they can drain their bank accounts down to nothing in just minutes, instead of draining it a little bit at a time, while waiting in line at the bank. Sometimes criminals have to call for assistance even with automated banking, if the bank card they stole won’t work, or even worse the automated teller machine takes the card and won’t return it to the bank card thief. The bank will send someone to the bank and tell them the pin number for the card and apologize for the inconvenience. My mom was very slow when using the automated tellers, and more than once someone would walk in the building housing the ATM machine and get aggravated about the long wait, then finally go back to their car, drive off with wheels squealing in search of a ATM machine with someone faster using the machine. Sometimes I wonder how we got by back in 1950 with no television, no cell phone, no Google, no icemaker, no GPS, no MP3 player, no ATM machine, no personal computer and no microwave oven. We managed to get by without all of these inventions, because most of them hadn’t been invented in 1950. The Adventures of Ozzie and Harriet was first broadcast on radio in 1944 and could be heard on radio, until 1954 when the radio show ended on June 18. 1954. Only 83 of the shows can be bought today for listening to, out of the hundreds of shows made during their 10 year run on radio. The Adventures of Ozzie and Harriet television program was first televised on October 10, 1952, and for the first two years could be heard on radio and seen on television, till the radio series ended in 1954. The last television episode was telecast on September 3, 1966. The 14 year run on television makes the Adventures of Ozzie and Harriet the longest running sitcom, on American television still 49 years later. Ricky Nelson recorded his first #1 song Poor Little Fool in 1957, which incidentally also was the first #1 song on the new Billboard Hot 100 chart. Ricky often sang on the show, which gave him even more exposure for his singing career. Don Defore portrayed Ozzie’s neighbor Thorny on the show. He would later gain fame as playing George Baxter on Hazel, when Hazel would refer to him as Mr. B.
Ozzie Nelson wrote 178 of the 435 episodes of the show. The shows are not being shown on any television network that I know of. If you know of the show being on television please comment, so we can share the information with other fans of the show. It is sad that the Adventures of Ozzie and Harriet shows are not being shown. The show represents life at a simpler time back in the 50’s and then continued to entertain fans, even though the country was at war with Vietnam in the 60’s and there was unrest on college campuses. All four members of the Nelson family have died since the show left the air. Ozzie Nelson died June 3, 1975 at the age of 79 in Hollywood, California. Ricky Nelson died December 31, at the age of 45 in a plane crash in Dekalb, Texas. Harriet Hilliard died October 2, 1994 at the age of 85 in Laguna Beach, California. David Nelson died January 11, 2011 at the age of 74 in Los Angeles, California. Kenny Rogers was being interviewed by Dan Rather on The Big Interview, and it gave me a chance to learn more about Kenny Rogers. He told Rather about growing up in Houston in the projects, and that his mother only had a third grade education. He said he didn’t realize how poor they were, till he started school and realized his family was on another rung. Rogers was born Kenneth Donald “Kenny” Rogers on August 21, 1938, when the president was President Franklin Roosevelt. He had a poor, but happy childhood and his mom told him to be happy where you are, and he remembered that advice during his career. 21 of his songs have reached #1 on the record charts. It was 38 years ago in 1977, when Lucille became his first #1 country hit. Daytime Friends also went to # 1 in 1977. Love or Something Like It went to #1 in 1978, while The Gambler peaked at #2 that year. She Believes in Me, You Decorated My Life and Coward of the County went to #1 in 1979. The hits kept coming in 1980 with Lady going to #1. Two lesser known songs reached #1 on adult contemporary charts in 1981, but two of his biggest hits Love Will Turn You Around and Through the Years topped the adult contemporary charts in 1982. 1983 would see Rogers have #1 duet hits with Sheena Easton on We’ve Got Tonight and Islands in the Stream with Dolly Parton. His #1 hits in 1984 were Rogers singing with Kim Carnes and James Ingram on What About Me. It went to #1 on adult chart, but only to #70 on country chart. Crazy was his other #1 hit in 1984. Morning Desire was his only song that charted in 1985 and it went to #1. Tomb of the Unknown Love was his only #1 song in 1986. Another duet this time with Ronnie Milsap on Make No Mistake, She’s Mine in 1987 was his last #1 hit in the 80’s. 12 years would pass, before he had another #1 hit. It was Buy Me a Rose, which was recorded with Allison Krauss and Billy Dean in 1999. His only other #1 songs were with Dottie West on When Two World Collide in 1978 and All I Ever Need is You, which was in 1979. Kenny Rogers starred in a series of movies about The Gambler. He also appeared in 17 other films and television shows. His last movie was a 2001 movie Longshot. His last television appearance as an actor was in How I Met Your Mother six years ago in 2009. He made six appearances as himself in 2014 and in five of those shows he sang, or was shown singing in a clip Islands in the Stream. He talked about his five marriages and how he may have been too selfish, and was away from home too much, because of his concert schedule. He expressed concern that he might not be around too much longer, for his 10 year old identical twin sons, since he is 76 and will be 77 in August. His current marriage with Wanda Miller will reach 18 years on June 1. He was previously married to Marianne Gordon of Hee Haw fame for 16 years. Kenny Rogers showed Dan Rather the Kenny Rogers exhibit, at the Country Music Hall of Fame in Nashville and it was an impressive exhibit. He was inducted in 2013 and he seemed to be glad that he wasn’t inducted sooner, when he might not have appreciated it as much as he does now. He sold 10 million copies of his Greatest Hits album, which earned him the prestigious Diamond Award, for selling 10 million albums. Rogers is currently on his Through the Years tour and is showing no signs of slowing down. He sure isn’t doing it for the money, since he is reportedly worth $250 million. March 07, 2015 7:00 p.m.
March 21, 2015 5:00 p.m.
April 10, 2015 9:00 p.m.
April 11, 2015 9:00 p.m.
April 24, 2015 9:00 p.m.
April 25, 2015 8:00 p.m.
May 08, 2015 7:30 p.m.
June 28, 2015 8:00 p.m.
July 16, 2015 8:00 p.m. The Kenny Rogers interview may be repeated on the AXS TV network, so check listings for the times. This article could have been titled 62 Years of Christmas Memories, since my first memory of Christmas would be of 1952 Christmas, when we lived close to Louisiana College in PIneville,, Louisiana. My first memory is of the Christmas stockings that were not hung by the chimney with care, since we had no chimney, but they still were hung with care. I will never forget my mom staying up all night, to wrap presents and hang the stockings. One of my favorite memories was going to S.H. Kress store in Alexandria and trying to make my money stretch enough to buy presents for everyone in the family, which consisted of mom, dad, two brothers and one sister at the time. It was fun wrapping the presents, even though my wrapping skills were rudimentary at best. Another memory is the Christmas tree lighted up with lights. We bought our trees from the Lion’s Club, where they were sold in front of Huey P. Long Hospital on Main Street. It was exciting to ride on the Boy’s Scouts float in the Christmas parade, when I was with the Pineville Boys Scouts. I will never forget the miniature church that would be displayed every Christmas in downtown Alexandria. It was misplaced for a few years, but the last I knew it is back on display again . City Hall lighted up for Christmas in the 1950’s. This photo was taken from the 2013 Christmas parade in Pineville. I can remember some brutally cold nights, on the night of the Christmas parade over the years. I haven’t been to a Pineville Christmas parade for at least seven years now, but time can’t erase the memories of the ones I have seen. 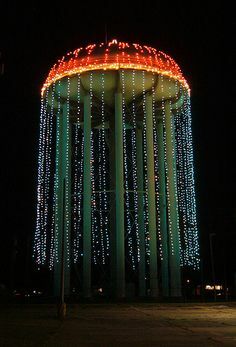 The Alexandria water tower lighted up for Christmas has been another Christmas tradition for many years. It was easy to find since it could be seen from a distance. One Alexandria Christmas parade in 70’s had an accident, which I personally witnessed. A reserve sheriff’s deputy was talking to my mom, then said he had to get back to work. A couple of minutes later that same deputy directed a car on a side street onto the street where the parade was almost starting . However, a Alexandria policemen, on a motorcycle on the parade route was hit by the car. The policeman flew up in the air and landed on the car. He was seriously hurt and if I remember right the accident happened before the start of the parade. I will never forget the policeman going airborne, before landing on the car. It was a highlight for me every Christmas when the faculty of Louisiana College and their families would have their annual Christmas party. I miss the Christmas Eve services at Pineville Park Baptist Church on Christmas Eve. The lighted candles, the music and the words spoken by the pastor made it a special night, that I always looked forward to each year. It wasn’t Christmas in Pineville, until the Christmas lights were put up during the Christmas season. We always had our family altar, before we opened Christmas presents. My mom would read the devotional that day, from the Home Life magazine. We would receive our Christmas bonus at the Alexandria Town Talk, for many years till Gannett bought the Town Talk and put a screeching halt to that nonsense. I was working for the Monroe Morning World in Monroe, Louisiana from 1974-1976 and will never forget the $10 Christmas bonus. It really wasn’t a $10 bonus, though since they took tax out of the $10, so the check was for $9 and a few cents left over. I will never forget one Christmas, when it was 8 degrees. The car wouldn’t start, when I tried to start it later that day, so I could go to work. I ended up walking the two miles, to the Town Talk and freezing in the cold wind. I spent three Christmases in Hawaii, while stationed at Schofield Barracks, in 1963, 1964 and 1965, before being sent to Vietnam. I went to a USO show, that had performers singing I’ll Be Home For Christmas. It wasn’t a great song selection, since I didn’t want to be reminded, that I wouldn’t be going home that Christmas. 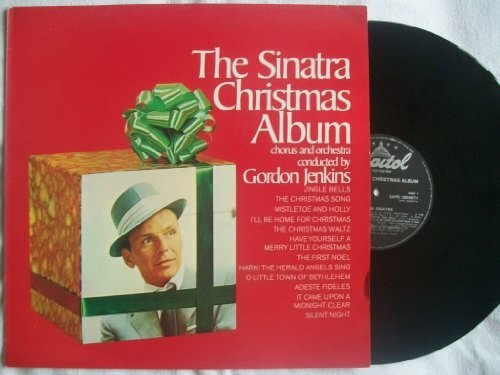 One of my favorite parts of Christmas is the great Christmas music. O Holy Night is one of my favorite Christmas songs, with O Little Town of Bethlehem a close second. My favorite secular Christmas songs are songs like The Christmas Song, White Christmas, Blue Christmas, Please Come Home For Christmas and Rockin’ Around the Christmas Tree. Bob Hope and Connie Stevens appearing in Bob Hope Christmas Show in 1970. The Bob Hope Christmas specials were another favorite part of Christmas. I was impressed that he missed many Christmases at home, to entertain American troops around the world. I also enjoyed the Andy Williams Christmas specials each year. 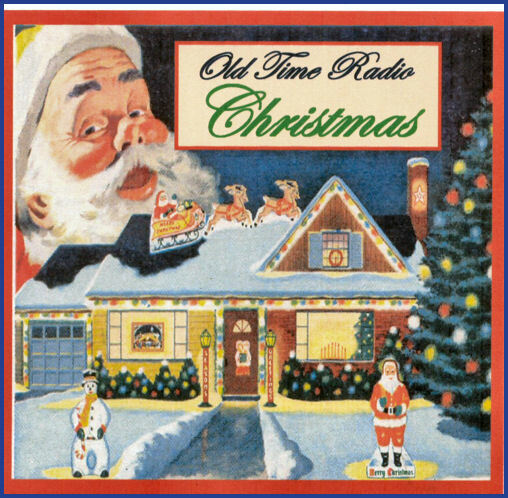 I collect old-time radio shows and some of my favorite shows are the Christmas episodes, of shows like Fibber McGee and Molly, Jack Benny and the Great Gildersleeve. One of my all time favorites is A Daddy for Christmas, which was heard on Family Theater. This is the funniest show I have ever heard on old-time radio. It is the first Fred Allen radio show ever broadcast from 1932 and is now 82 years old. Best part is when a speaker gives a pep talk to the employees of the Mammoth Department Store. Fast forward through the music at the first to get to show. It can be heard on You Tube. You can be glad you weren’t around in 1932, because the music is terrible, but just fast forward through it, especially the lady that is making a futile attempt at singing. It is sad they didn’t have the technology in 1932, to rid the show of all the horrific singing. The Jack Benny Christmas program is hilarious, and the dialogue between Jack Benny and Mel Blanc shown in photo is priceless. The show is funny from start to finish. It’s A Wonderful Life is the best of all the Christmas movies, but that is only my opinion and my opinion with three dollars will buy a gallon of gas, so it is not really worth that much. Jimmy Stewart and Donna Reed are the most recognizable stars in the movie, but Frank Faylen, who portrayed the father of Dobie Gillis, in the show of the same name was a cab driver in the movie. Green Acres was one of the cornier CBS country comedies of that era, but at the same time it was one of the most entertaining. Eddie Albert and Eva Gabor were involved in the main plot, for each episode but the comedy ensemble backing them up is what set the show apart. Eva Gabor and Eddie Albert as Oliver and Lisa Douglas who gave up big city life to move to Green Acres. Who can forget county agent Hank Kimball played by Alvy Moore? Then Tom Lester the farmhand who was portrayed by Tom Lester. Mr. Haney kept us entertained as the con man, who sold Oliver Douglas useless items, that didn’t work often during the life of the show. 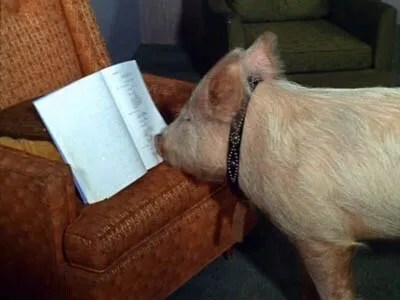 Arnold the pig studying movie script for next movie. Fred Ziffel played by Hank Patterson, on the show owned a pig named Arnold. It turned out that Arnold like to steal scenes, from the humans appearing the show. Arnold would be about 50 this year, if still living at the Retired Home for Animals Who Acted. The rumor that the cast had a luau after the last episode was aired, with Arnold as the main course was completely untrue. Mr.Haney the fast talking con man trying to pull over on Oliver. Eva Gabor portrayed Lisa Douglas the wife, who didn’t really want to live on the farm, but put up with it for the sake of her husband Oliver Douglas, whose dream was to own a farm. He never would have followed his dream, if he knew ahead of time that he would be dealing with a shady con man in Mr. Haney, a inept county agent in Mr. Kimball, a pig that liked to watch television and a farmhand that didn’t know a wheelbarrow from a hay wagon in Eb. Eddie Albert revealed that he had a 10 percent interest in the show, so probably reaped a rich dividend, when the show went into reruns. 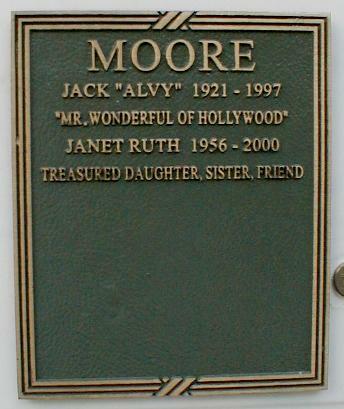 Grave marker for Alvy Moore better known as Hank Kimball on the show. Mr. Haney according to imdb.com based his character on Col Tom Parker, who reportedly took 51 percent of the income of Elvis Presley, with Elvis having to eke out a living on the other 49 percent. Oliver usually wore business clothes, even when working on the farm. Lisa Douglas: Why do you want to irritate your corn? Oliver Douglas: Irrigate. It means put water on it. Lisa Douglas: Won’t that irritate it? Eustace Charleton Haney: [after learning Oliver and Lisa are going to be out-of-town for a few days] While yer away on yer trip, I thought you might like to avail yerself of Haney’s Farm Mindin’ Service. Oliver Wendell Douglass: HANEY’S FARM MINDING SERVICE? Eustace Charleton Haney: Yessir, at Haney’s Farm Mindin’ Service, for a nom-yew-nal fee we will move into yer house, eat yer food, drink yer likker, and turn away any unwanted relatives that might show up at yer door. Oliver Douglas: Why don’t we give away this one? Lisa Douglas: No that’s the dress I graduated from high school in. Oliver Douglas: How about this one? Lisa Douglas: That’s the dress I wore the first day of college. Oliver Douglas: [holding a black, low-cut dress] What about this one? Lisa Douglas: That’s the one I got expelled in. Green Acres was a victim of the CBS purge of rural comedies, because CBS thought the shows were only attracting rural and older audiences. 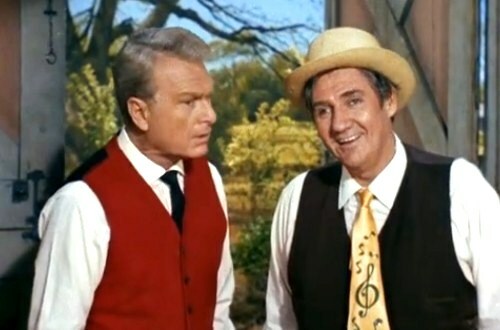 Just writing this article makes me want to watch one of the Green Acres shows, but not sure if it is even shown anywhere on TV today. Sid Melton 1917-2011….portrayed Alf Monroe on the show. He also appeared in 93 episodes of Make Room For Daddy, in which he played Charley Halper. Mary Grace Canfield 1924-2014….was Ralph the wife of Alf on the show. She also played Gomer Pyle’s girlfriend on an episode of Andy Griffith. Tom Lester 1938-present….only surviving cast member of the show and is now 76 years old. Highway Patrol was one of many classic television shows, that are either hard to find or not on television today. The plots of the show were simple, which is unlike some shows today, that take awhile before you even figure out who the bad guy is. Broderick Crawford was perfectly cast as Chief Dan Mathews in Highway Patrol. Chief Mathews portrayed a no-nonsense cop, who was famous for saying 10-4 on is police phone. The problem today is that it is seldom seen on television today or if it is, then it is relegated to an early morning slot like 4AM. The show to me was better than a lot of detective shows being seen today. The show was on television from 1955-1959. Bob Denver, Tuesday Weld and Dwayne Hickman in a scene from Dobie Gillis. The Many Loves of Dobie Gillis (1959-1963) was one of my favorite shows to watch. It doesn’t seem possible, but Dwayne Hickman who portrayed Dobie is now 80 years old. 51 years have passed, since it was last seen on network television. Actors who appeared on the show and went on to greater fame included Bob Denver, Tuesday Weld, Warren Beatty and William Schallert. Frank Faylen who played Dobie’s father appeared in the Christmas classic movie It’s A Wonderful Life as a cab driver. This is another show that as far as I know can only be found in the early morning hours. William Bendix on The Life of Riley was one of my favorite shows to watch. 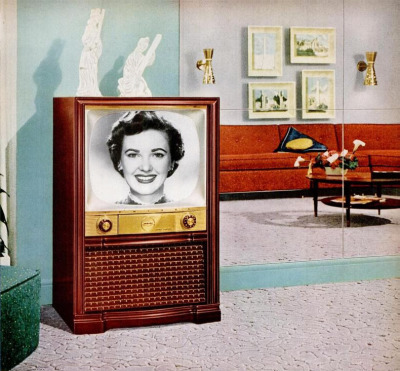 The show had already been on television a year, before we even bought our first TV set in 1954. Loved watching Bendix portraying Chester A. Riley, who was the polar opposite of Ward Cleaver on Leave it to Beaver and Jim Anderson on Father Knows Best who portrayed next to perfect fathers on television. Riley on the other hand was a stumbling, bumbling oaf, that while he had good intentions had a proclivity for being put in the worst possible predicaments. Riley was known for saying “What a revoltin’ development this is”. Sadly, as far as I know this show cannot be found anywhere, on television today 56 years after the last show was aired. 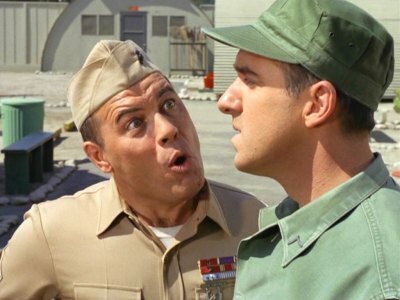 Anyone that has served in the military has encountered someone who reminded them of Gomer Pyle at some point in their career. Jim Nabors, who left the Andy Griffith Show to portray the same character, that he had portrayed in the city of Mayberry, North Carolina. The casting director could have taken years, to cast the role of Sergeant Vince Carter, but they got it right the first time, by hiring Frank Sutton for the role. Sadly Sutton died 40 years ago in Shreveport, Louisiana when he was acting in a dinner theater. Gomer Pyle used to also be shown in the early morning hours, but the last I knew it is not being shown on television today. Father Knows Best is the first show I think of when thinking of a typical American family. They had their share of problems, but they were solved by the time the show ended 30 minutes later. I was in the Veteran’s Hospital in Houston and the Antenna TV channel had Father Knows Best and it was fun to watch the show, and helped take my mind of the cancer surgery I had recently, even if only momentarily. This is only channel that I know of, that shows this show 54 years after the last show aired on network television. 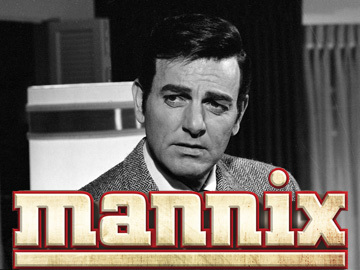 Mannix was one of my favorite detective shows on television. Mike Connors who portrayed Mannix is now 89 years old. He made his last television appearance on Two and a Half Men in 2007. I remember the show, as a show that could hold your interest. Gail Fisher portrayed his secretary Peggy Fair and was the only one on the show besides Connors, that appeared in at least 100 episodes.Fisher died 14 years ago tomorrow (December 2). This show is not seen on television today as far as I know. Tod and Buz, in Cleveland, Ohio working as laborers on a “three-week job at a gravel yard”, stay at their Russian supervisor’s home. He has a mute daughter who has a miserable life. When a fellow Russian, whom the community has ostracized, shows his love for her tragedy follows. The two ill-fated people meet an uncertain end. Nehemiah Persoff portrays the father of the mute daughter, who is portrayed by Lois Smith. Classic television fans will notice Allan Melvin, who was later Sam the butcher on Brady Bunch and also appeared on episodes of Andy Griffith and Sgt. Bilko shows. 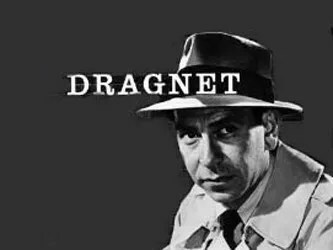 I never was too enthused about the newer 1967 version of Dragnet, after having seen the original black and white version from 1951-1959. I like color television, but still don’t mind watching black and white shows, since they let you concentrate more on the show, than the color scenery shown on a color program. 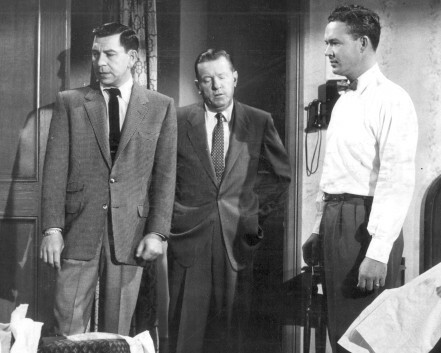 Jack Webb and Ben Alexander shown in scene from Dragnet. I have always liked the photo of Joe Friday’s partner Frank Smith in the middle of the above photo. He seems to be falling asleep on the job and is grabbing some shuteye, while Friday does all the work and questioning. Dragnet to me was television at its best. These shows are rarely if ever seen today, since the cable networks seem to opt for the color version, with Harry Morgan of M*A*S*H fame portraying Officer Bill Gannon. I am not saying the later version was not a good show, but after you have seen the best, then you don’t care as much about later version. Note – Anyone that knows where any of these shows can be seen today are welcome, to post that information to the comments section…Thank you.